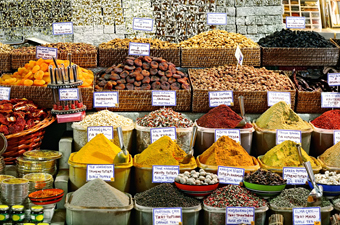 The Kingdom of Morocco, has been enchanting travellers with its exotic sights, alluring sounds and aromatic smells for centuries. This amazing tour travels across the dynamic country of Morocco from desert to mountains, encompassing fertile coastal plains, olive groves, colourful souks, Arabic nomads of Berber descent and the legendary expanse of the compelling Sahara Desert. Morocco is still largely wild, remote, with bustling markets, palm fringed desert oases linked by nomadic desert caravans and a technicoloured cultural tapestry imbedded in primeval history.Starting in Casablanca we move onto the old imperial city of Fes, an amazing labyrinth of alleys and souks. It offers a journey into a fascinating foreign land of rich cultures, elegant imperial cities and amaranthine walled medinas such a Fez, Meknes and Marrakech, brimming with contrast, sensuality and mystery.Our journey south continues, entering the Sahara desert at Merzouga where we can sleep amongst the highest sand dunes in Morocco. 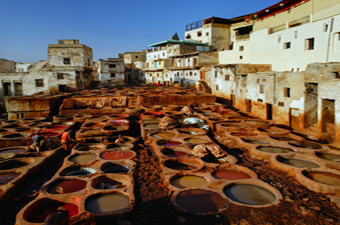 We then spend time discovering the remote communities of Morocco’s High Atlas Mountains and the Rif, to the white washed coastal fishing ports on the western shores such as Essaouira , the immersion in to this alluring Kingdom is a delight and sensory overload for history enthusiasts, naturalists, hikers and adventurers, before ending in the legendary city of Marrakech. An inspiring tour for the true traveller. Whether you visit Morocco for the endless summer or to trek through the endless mountains trails between Berber villages or head into the desert on a camel, its timeless energy and friendly locals will leave an overall memory of mint tea, the call of muezzins from ancient minarets, brightly coloured souks, roman charms and Arabic heritage as you journey through its dynamic landscape. Arrival in the city and taxi to your hotel for check-in. This afternoon, you are taken to the very impressive Hassan II Mosque by your driver. As this is one of only 2 mosques in Morocco non-Muslims are allowed to enter, you may like to take the opportunity and enter (optional). The Mosque opened in 1993 and can accommodate up to 100 000 people, 25000 of them in its main central hall. It has the tallest minaret (210 metres) which points in the direction of Mecca. Back to the hotel for a free afternoon. Depart Casablanca today to travel north to Rabat, known as the White City. Here you will enjoy a tour with a local guide, visiting the beautiful Kasbah of the Oudaya, the Hassan Tower, the Mohammed V Mausoleum, and the Royal Palace & Mechouar (exterior). Continue on to the Imperial city of Meknes for some free time to explore. Morning tour of Meknes with a local guide. You will be able to view the Mellah (Jewish quarter), the Royal Stables, the Bab El Mansour Gate and the famous city walls. After lunch, head to Volubilis for some time to explore at leisure. Volubilis is famous for its magnificent in situ mosaics. Most of the visible ruins date back from the 3rd century CE. Note the carefully laid street plan, still visible today is a great contrast to the chaos of Moroccan Medinas. Continue on to reach Fes, the artistic, intellectual and religious capital of the country. Full day sightseeing tour of the medieval city of Fes. Visit the medina, the heart of the old city, with its fascinating souks, tanneries, artisan quarters and remarkable Islamic architecture. A long day of travel today. Early departure to Azrou, a Berber village known for its handicraft cooperative. Continue via Midelt and the route carved by the Ziz River, passing many fortified villages to arrive in Erfoud. This morning you will have to rise early to witness the spectacular sunrise over the dunes. Breakfast. Departure for Tinerhir along the Tinejdad road with its spectacular Kasbahs. Afternoon visit of the famous Todra Canyons. Free day. You will have various trekking and walking options today as offered by your accommodation. Options offered include 4WD transfers to the Jebel Saghro where you can enjoy 3 or 6 hour walks or a more relaxed day could include a guided walk through the Jewish quarter in Tinerhir itself. (optional excursions, payable locally). Departure for Ouarzazate via El-Kelaa, famous for its May festival which celebrates the harvest of the roses. Continue through the Dades Valley along the road of a Thousand Kasbahs, stopping for a sightseeing and lunch break in a local café or restaurant in the Kasbah of Skoura. Continue on to Ait Benhaddou where you will spend the night. The town has been the setting for as many as 20 films, notably Lawrence of Arabia, Gladiator and Jesus of Nazareth. Much of the village was rebuilt for the filming of the movies. An interesting journey today as you cross the High Atlas mountains via spectacular Tizi-n-Tichka pass. 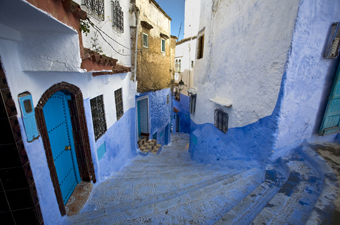 First, you will stop to admire the Kasbah of the Glaouis in Telouet before continuing on and travelling to Imlil. Explore the village, nearby hamlets and the surrounding mountain landscape, on foot or by mule, or just put your feet up and relax on the terrace or in the hammam (steam bath).. Depart Imlil and travel through Marrakesh as you travel to the coast, to Essaouira. The old Portuguese port of Essaouira is one of the most popular coastal towns because of its magnificent beaches. Today you have a free day to enjoy the beach and port area at your leisure. You’ll find narrow, freshly whitewashed streets, painted blinds, tranquil squares, artisans in tiny workshops working away at fragrant thuja wood and friendly cafes. Be sure to enjoy some of the wonderful fresh local fish in one of the many restaurants or cafes. 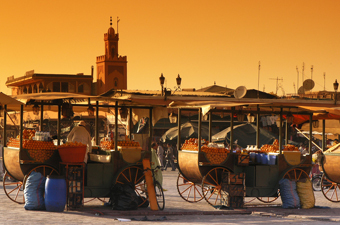 Today you depart Essaouira as you travel on by private vehicle to Marrakesh. 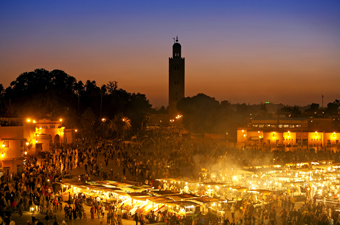 Marrakesh is one of Morocco’s most important artistic and cultural centres. It was founded in 1062CE by Almoravide sultan Youssef Ibn Tachfin. Arrival and check-in. This afternoon, you have a dusk/sunset tour of the Menara Basin and the Majorelle Gardens, the beautiful private gardens owned by Yves Saint Laurent. 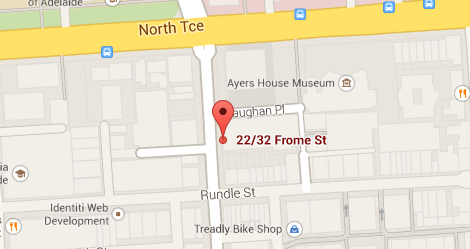 Enjoy a half day tour of the city today. You will visit the Saadian tombs, Bahia Palace and explore the colourful souks with your guide. A highlight of your tour is a visit to a women’s cooperative in the heart of the Medina. You will be able toafternoon at your leisure. The Souks of Marrakesh are some of the best in Morocco, producing a wide variety of high-quality crafts, including brass plates, leather work, woodwork and carpets see and purchase the work that the women produce and support the community in a tangible way. Free. Want more time in Morocco? Why choose to spend a couple of nights in one of the most photogenic mountain villages in Morocco, noted for its blue-washed walls and old world charm. Step back in time and embrace the exotic maelstrom of mysterious labyrinths, ancient footpaths, lantern-lit souks, spice markets and alchemist stalls of the Marrakech’s main square. Meet snake-charmers, musicians, palm readers, water sellers with brass cups, Chleuh dancing-boys and acrobats as you walk through, inhaling the aroma of sizzling Moroccan delicacies and mint infused air – A UNESCO Masterpiece of the Oral and Intangible Heritage of Humanity.